Salomon’s XA Pro 3D is a heavy duty trail running shoe that has been around, with various updates, for years. It is very heavy and firm for a running shoe, and I use it as a low light hiker. It’s available with a waterproof/breathable membrane, but I like the no-membrane version for it’s very good breathability. Very good traction, support, foot protection, and durability, plus an interesting lacing system, make this a winner. The non-waterproof version’s availability in wide sizing was fortuitous for me, as the regular version was too narrow for my feet. The pair weighed 2.2 pounds out of the box, including the light insoles that I discarded. The guy who built my latest pair of custom orthotics recommended this shoe for its relatively firm and more supportive midsole, and I always wear them with the orthotics. The shoe requires break-in because it is so solid; it takes some time to get used to the firmness of the shoe. More on that in a bit. 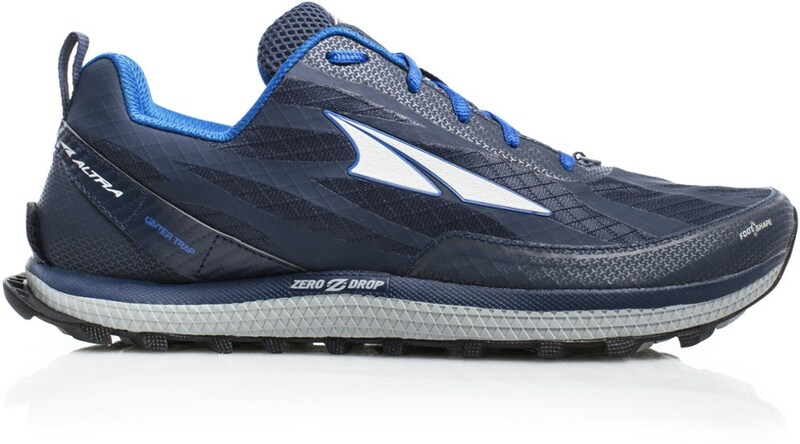 These are on the heavy end of the spectrum for trail running shoes, and also on the more expensive end at $130 full price. 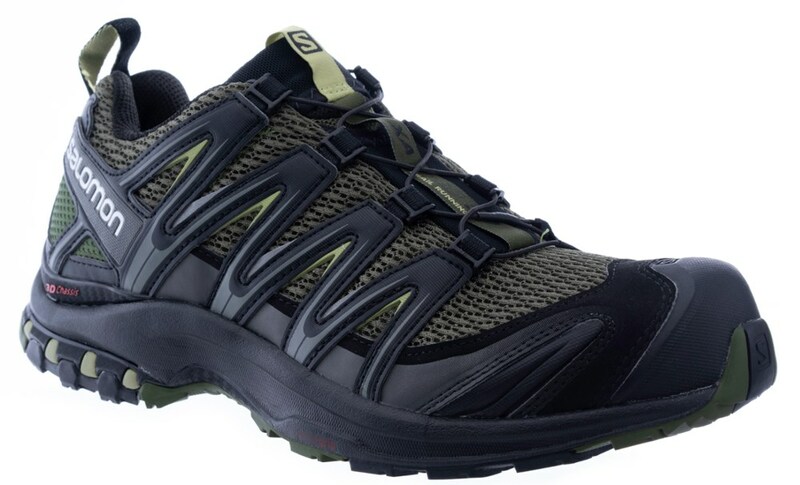 Though Salomon sells this shoe as a trail runner, I use them as my primary go-to low hiking shoe. It has a number of features that work well for runners: a midsole that has some motion control built in for people who pronate. Speed lacing that is secure and easy to adjust. 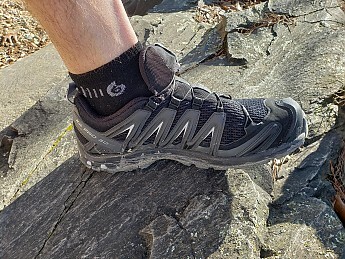 A rock plate built into the midsole that protects your feet from pointy rocks and uneven ground. A sole that grips well on wet surfaces. 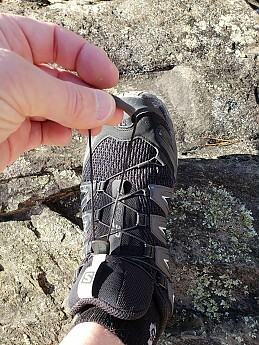 Easy to use loops at the heel to help pull them on and off. rear view of the shoe that shows a solid heel counter and the rear grab loop. The lacing system is worth particular mention as I’m normally not a fan of speed lacing. The laces are very skinny, but made from Kevlar. That should translate to outstanding durability, but Salomon sells replacements that are reasonably priced. The asymmetrical lacing does an excellent job keeping your feet in place. Also, the speed lacing doesn’t loosen up and is very easy to adjust on the fly. front view shows how the laces work—asymmetrical, with that longer front section, which is helpful for keeping your foot locked in. Also, nice view of the toe bumper to keep your toes from getting bashed. This is what the end of the laces looks like—what you use to pull them tight. At the end of the laces I'm holding in this photo, you can see a light-colored loop. That is what pulls the stretchy "garage" open to hide the end of the laces and the toggle that pulls them tight. Helps eliminate laces getting snagged on roots and brush. It’s also worth mentioning the stretchy "garage" for the laces so they don’t accidentally snag. A very smart design feature. While it’s a little annoying to have to tuck in your laces, it works very well. Side view, shows the stretchy part at the top of the tongue that stows the laces. The toe area is well-suited for trail running, with a good, hard bumper that extends over the top of the shoe. Good photo of that above. FIT is average to narrow for the regular width shoe, but you can buy them in wide sizing (only in the non-waterproof, no-membrane version; the waterproof/breathable version doesn’t have width sizing available). My feet are wide in the front, and I need more room anyway to accommodate orthotics. I wear these with lightweight ankle high wool socks—Point6, FITS, Darn Tough all make socks that work very well for me with this shoe. The lacing system, particularly the lace that extends across the front of your foot, helps keep your foot from sliding forward on downhills. These run true to size otherwise. SUPPORT is very good for a shoe of this weight and profile—very firm, with a midsole that is designed for people who overpronate to some degree. I have very flat feet, and with custom orthotics, these shoes feel very stable and secure. That support does come with a price in terms of comfort. This is not by any means a soft or cushy shoe, and some people might not like that. The midsole doesn’t flex as much as many shoes in this category due to the rock plate built into the midsole. For someone who needs that support and wants protection from hard landings on trails, that’s an excellent feature. All of this translates well into a shoe that’s very useful on trails but also comfortable wearing all day on weekends. THE SOLE is pretty grippy on slick surfaces, which is helpful. 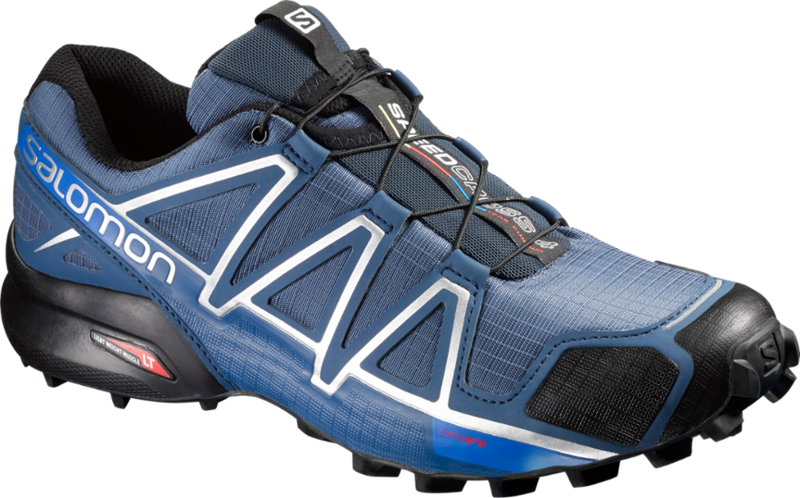 It’s worth observing that in Salomon’s fairly robust options in the trail running shoe category, the lugs on this shoe are only moderately aggressive. I learned this recently on muddy trails in our area—we had record rainfall this year and a very wet fall. These shoes occasionally skidded in very sloppy parts of the trail. 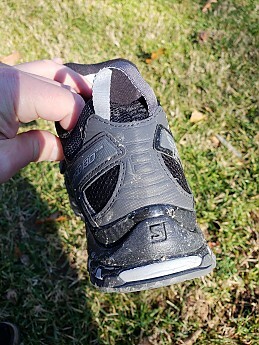 This shows the lug pattern on the shoe. Good traction in all but the muddiest conditions. Note the soles don't tend to shed mud—I cleared the treads here by whacking them against the bricks. DURABILITY should be outstanding for the midsole, the uppers, and Kevlar lacing. Soles that are more grippy tend to wear faster; it remains to be seen how that works here. I predict the soles will wear better than the soles on my super-sticky approach shoes but not as long as the Vibram block soles on my leather boots. BREATHABILITY is a strength of this shoe because it doesn’t have a waterproof/breathable membrane and has large areas of nylon mesh. (I don’t have particularly sweaty feet, so waterproof/breathable or all-leather boots don’t bother me). If you need a waterproof low hiker and don’t need the wide sizing, look at the Goretex version for thirty dollars more. Note how the shoe combines big areas of breathable nylon with stiffer v-shaped material attached to the laces to provide lateral support. Nicely done. The flipside is that while I haven’t puddle-jumped much in these, I would expect some water to get in if I were to step in a deep puddle. I have walked 45-50 miles in these over the past two to three weeks, primarily on trails and on dry days. They have seen some trails that are about half dirt path, half rocks. I haven’t carried anything more than 20 pounds in a pack during any of these walks. Whether you think of these as a heavy duty trail running shoe or a light hiker, Salomon has done a really nice job with this shoe. That explains why this model has been on the market for so many years (with periodic updates). If a shoe that’s this firm and supportive works for you and your terrain, this is a great choice. And, with variable width sizing, you’re more likely to find something that fits! 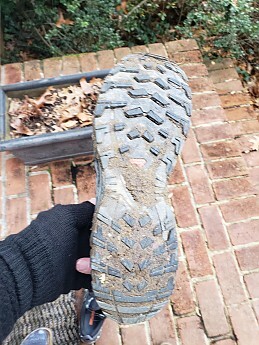 Two to three weeks of steady use on local trails, including a day or two walking around in them to break them in. 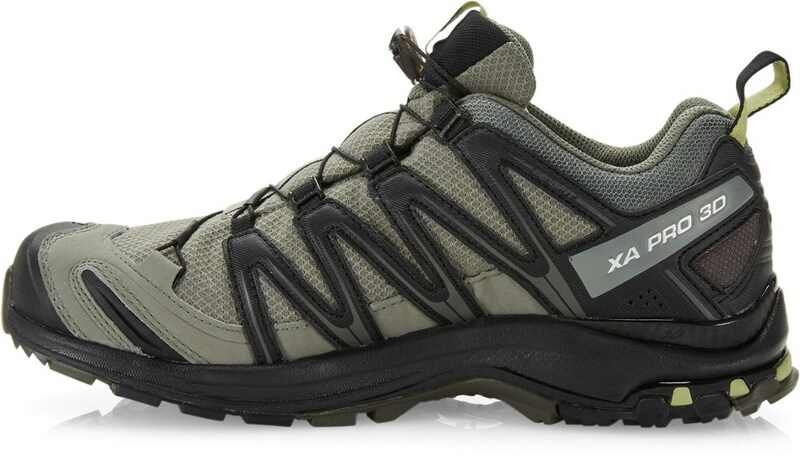 The Salomon XA Pro is a great shoe for lightweight hiking and backpacking. This shoe provides stability, durability, protection, and comfort. I've gone through three pairs of these shoes, and most recently wore a pair that held up beautifully on a thru-hike of the John Muir Trial. Upper: The majority of the upper on the XA Pro 3D remains unchanged from the 3D Ultra. 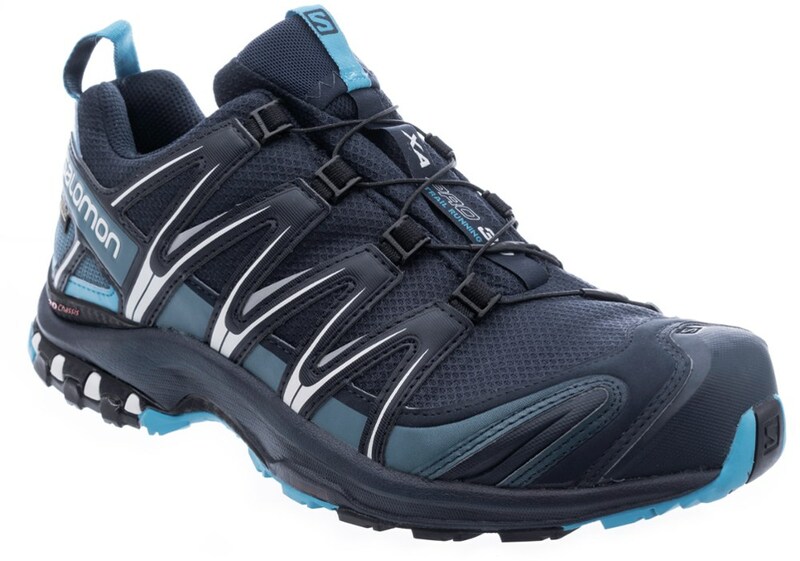 This is not a lightweight shoe when compared to most trail runners, but compared to hiking shoes and boots, they’re pretty light. The structure is made up of well constructed overlays that Salomon calls SensiFit. I absolutely love this, as it allows me to dial in my ideal fit of a snug heel and midfoot, with a little wiggle room for the toes. The rest of the upper is made from a light breathable mesh. Having walked through days of mud and rain on Tour du Mont Blanc, I can tell you that these dry very quickly. The mesh has seemed a bit porous with the dusty trails here in the San Gabriels, but that’s the price you pay for breathability. The rubber toe cap is quite burly for a trail runner, but fits in quite nicely for a pair of lightweight hikers. The is a mesh gusset cover over the tongue and does a good job of keeping out smaller pebbles that can find their way in to shoes. The greatest improvement on this new model (compared to the last 3D Ultra) is the endofit liner. The endofit is a thin neoprene liner that’s incorporated with the tongue. This means the shoe only has one contact point on your foot from your ankle to your toes, and does a great job at reducing potential friction points. I’ve always been a huge fan of the Salmon kevlar quicklace system, and with these shoes its no different. I wish they would ditch the same-side lace anchor attachment, but that’s just me being picky. Midsole: The midsole of the XA Pro 3D suits my preferences quite nicely. The heel drop is a little higher than I prefer, but the stability of the shoe more than makes up for it. 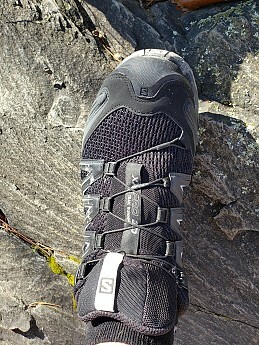 Salomon employs the 3D chassis system on these, keeping the shoe torsionally rigid. This is something I pay no mind to when day hiking with only water and a light layer. With a heavier pack, rockier trails, and day after day of 20+ miles, I need a little more structure to keep my feet and legs from fatiguing too quickly. The XA Pro 3D does this perfectly without feeling to stiff or constricting, with dynamic support in the heel and arch areas. Those that like a cushier ride may find these a bit firm, but I like the well balanced platform. The 3D Chassis provides ridged rock protection from the heel to the midfoot, and a dual density EVA provides the push through protection in the oval shape on the forefoot not covered by the 3D Chassis. I wish they used something a little more robust as I can feel the rocks after about 20 miles on the trail, but it’s hardly something to complain about. Outsole: The outsole is clearly made for durability. I’ve put close to 400 miles on my first pair and they show no very little signs of wear. This durability is great as most of my shoes blow out around 400 miles of wear, I’m thinking these should get closer to 600. The downside of the harder rubber compound used for durability is that these shoes really lack for grip is certain conditions. I wear these in the Eastern Sierra, and they really struggle for purchase on the granite slabs. It’s an easy sacrifice for me to make though, as most of my weekly hiking doesn’t require sticky rubber. 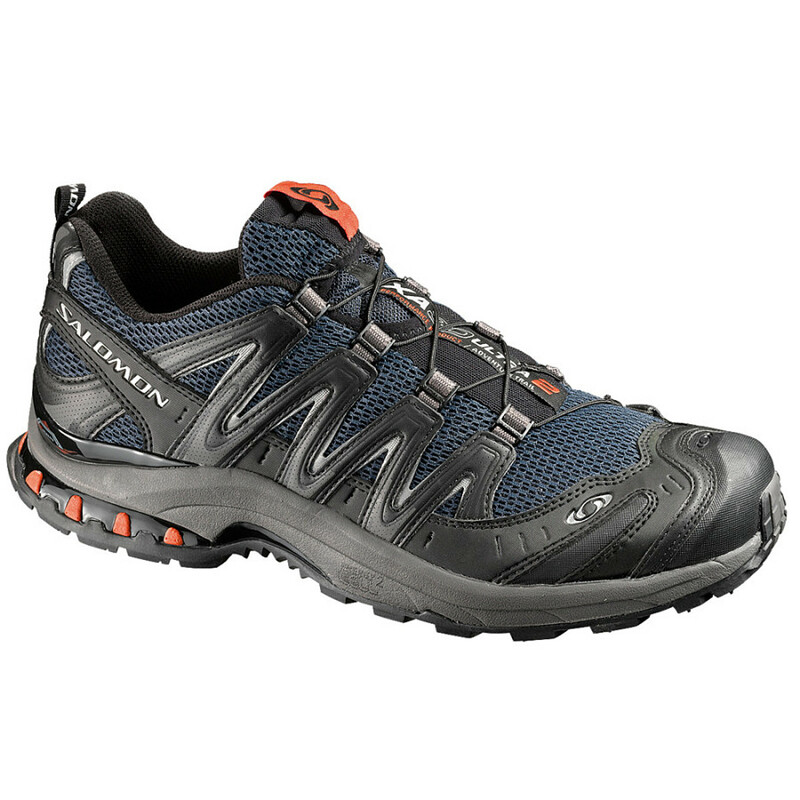 In conclusion, this is another great shoe from Salomon. It’s a jack of all trades that doesn’t really specialize in anything, but can be used by just about anyone on any hike. 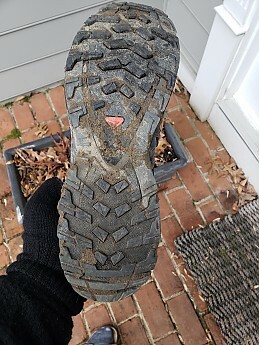 As someone who has grown tired of lighter weight shoes blowing out and having outsoles disintegrate after 200 miles, I’ll take a little bit of extra weight for the added durability. Thanks for all the helpful shoe reviews, Drew. I'd love to see some pics of your shoes too, to see how well they've held up. These are my now go-to hiking and backpacking shoes that replaced my boots. It's also nice that they double as trail running shoes as needed. These are perfect for someone who wants to move fast on the trail but still wants the ankle support of a boot. I'd definitely recommend these if you are looking for a light fast and grippy shoe for all kinds of terrain. 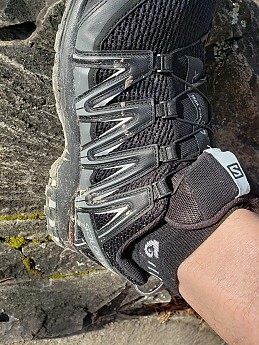 Just took these shoes on a cross-country backpacking trip, everything from climbing up and down talus, hike on unkept trails, through meadows, up and down passes. They performed amazingly. The fit is true to size and feels great, tightening the laces with the awesome lacing system gets you an even more snug and comfortable overall fit. 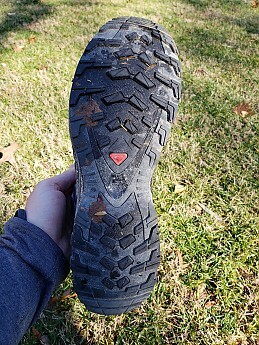 This was the first time I used them so I broke them in on the trail, but they were great the entire time. I did get blisters, but that was not the shoes' fault. I had purchased some SuperFeet for my bad arches and the footbed from those didn't agree with my feet. I have since used the shoes with the regular insoles and it felt much better without the SuperFeet. I would definitely recommend using a lightweight gaiter with these though. I did get dirt and small rocks inside, but it was super easy to take on and off to clean out. I also carried a spare pair of laces just in case they were to break, but I had no problems in that area at all. These aren't waterproof and on my 4-day trip in the High Sierras we did get hit by a 7 hour storm, so my feet were pretty wet (there was no cover to hide under) just got downpoured on. The shoes dried out much faster then a pair of GTX shoes would have once the sun came out. The grip on these shoes is insane! We had to descend a super sketchy talus mountain side while it was raining and thundering. 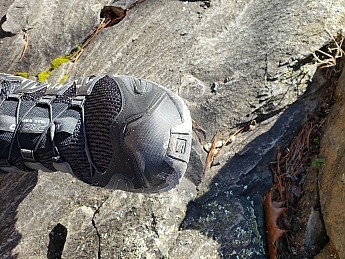 If the rock has any kind of texture even when it's wet these don't slip. My friend who had waterproof boots was slipping all over the place! If the rock is smooth and wet there really isn't any shoe that will help you in a situation like that, just gotta be cautious. On regular dry vs wet ground I felt absolutely no difference in traction, gripped perfectly. My feet were also the perfect temp, never overheated at all. I look forward to using these more and more when I go out hiking. Thanks for sharing this helpful review, Cameron. I hope you'll keep us posted on how the shoes continue to hold up. p.s. Nice highline pic. I have so much I want to say and ask about this review! First, I'd love to see some pictures of the treads and the ankle support. Second, I found Superfeet to be lacking. 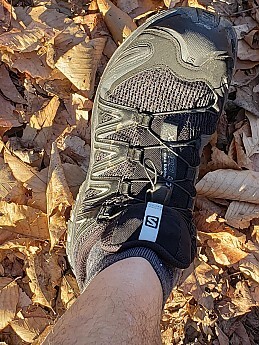 Try Sole inserts https://www.trailspace.com/gear/sole/softec-response/#review31307 Much superior. Third, did I mention wanting to see some pics? Cameron...I think you have a great shoe here (I use them myself)...they are really beefy shoes for the weight (the toe-box is particularly well done)...and the lacing system is incredibly fast and easy. Maybe you could add some detail about the lacing system (a photo or two for Goose) and the more protective elements since these aspect of the shoe make it special? 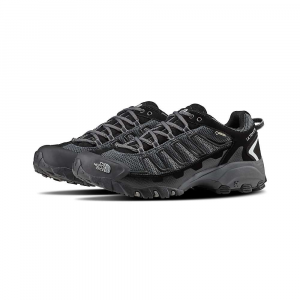 I bought two pairs of these shoes, one Goretex and one not Goretex for a walking holiday at the end of April. They are perfect for me in size, comfort, and ease of use with a plus point of a really interesting range of colours to choose from. However I believe the Goretex ones have a big design fault! Whilst wearing them in, I have now found that as I am walking and the shoe bends, the front top lace holder rubs on the Goretex shoe and has rubbed a hole in the Goretex outer liner which now means the rain and mud can pour in! Salomon I am so very disappointed!! What can I say! I certainly wasn’t expecting this from these shoes that are great in every other way! Has anyone else experienced this or are mine faulty? Real design fault rubbing a hole in the Goretex layer!!! Expensive shoe to have this happen to! If Salomon can suggest a solution, then please do?? Or anyone else please! Really feel let down as I am supposed to be walking the Camino in these and now will need to find a replacement or repair which may not last the trip! Welcome to Trailspace, Colly! Too bad about your issue with these Salomons. Have you asked the brand for any assistance? Also, if you have some pictures fo the shoes and their issues, those would be great for others to see in your review. Planning to hike the AT for two months this fall. Planning to hike the AT for two months this fall. Needed a lightweight and breathable shoe that is waterproof. This shoe fits those requirements. Love the comfort while hiking. Purchased these for fall hiking on the AT. They are waterproof and breathable. I'll be on the trail in September and needed a shoe that can help manage the heat my feet will generate. Easy to lace and lightweight. Runs small. I ordered one size larger and they fit perfectly. Welcome to Trailspace, Phillip. I hope you'll let us know how well the shoes work for you on the AT this fall. Have fun! 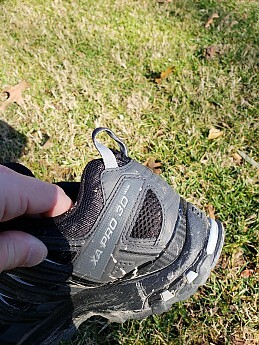 Shoe has held up well, however one of the shoelaces broke. Not sure how you replace the factory shoelace as Asymmetrical lacing has multiple loops that are "factory" tied off. I used a conventional replacement shoelace that was larger in diameter than original shoelace. After repeated attempts (30 mins.) I finally replaced shoe, however I was only able to use the upper eyeholes as the asymetrical eyeholes will not work with a traditional shoelace. I have had knee problems ever since I was a teenager--"overuse," they used to say. I walk primarily on the outside of my feet and then roll inward; there's a term for it, but I can never remember what it is. Doctors have always told me to wear Asics 2100s, which I was doing, but the knee pain never went away, and I always had to limit my endurance running, which made me unhappy. A year and a half ago I purchased these trail runners at Appalachian Outdoors in State College, PA, because they were on sale and I thought I would try a different type of running shoe. The salesperson said these shoes are many endurance runners' favorites, and I thought--what do I have to lose? Well, I'm on my third pair now (the XA Pro 3D Ultra), and I couldn't be happier! Ever since I started running in these shoes, my knee pain has almost completely gone away. It's unbelievable to me. I thought I would have to give up running someday soon (and I'm only 29), but now I am running more than I was in the past. I want to kiss the person who designed these trail runners! I have no idea how these shoes caused my knee pain to disappear, but I don't care. I will be a Salomon XA Pro 3D customer for life! I've owned a few pairs of these now, and can honestly say they are the best fit of a trail shoe i have had. They are comfortable, the soles have great traction, great stability, i liked the lacing system...though have seen a few broken ones through work, and i think its not awesome for people with narrow feet as you end up with a lot of dangling cord hanging around. the reason i give them 4 stars is the durability. the last pair i had lasted less that 6 months, only used hiking and trail running. the soles wore out so fast! the inside at the heel also wore out quickly, but it is a common problem with my heel shape and would happen to any shoe. bottom line: very comfy and stable. not very long lasting. This is my first pair of Salomon shoes. They are exactly what I expected. My father got a pair about 3-4 years ago and i have worn them a couple times and i was hooked ever since. A lot of people complain about how the laces are a pain, but i think that these laces, with the zip-tie like function, is the way laces were meant to be. whats easier? taking a minute to tie both laces, or simply give the cord a good pull and fasten the lock and be on your way? and the comfort of these shoes are unmatched. when you put them on for the first time you freeze for a second and think, hey these aren't too hard or too soft and they aren't tight either. after wearing them for a while, i don't think that there is a break-in period for these shoes. the main thing that caught my eye other then the 30% off sales tag, was the great look of these shoes. the shoes aren't very heavy at all. the one flaw in the shoe is that they aren't gore-tex or waterproofed in the mesh area near the middle of the foot. overall these shoes might be the best pair i have owned in a long time or ever. The shoe itself overall is great for the price, but I'm just not that fond of the lacing systems. Same problem I had with the XA Comps, after a while the lacing systems just seem to unravel. That steers me away from non-conventional lacing. Shoelaces are still the number one for me. Bought and returned to REI, no hassle, no problem.